Amazon Price: $19.99 (as of February 3, 2019 9:41 pm - Details). Product prices and availability are accurate as of the date/time indicated and are subject to change. Any price and availability information displayed on the Amazon site at the time of purchase will apply to the purchase of this product. Accessorize your wedding, bridesmaid or special occasion dress with Mariell’s glamorous vintage crystal bridal brooch pin in a dramatic art deco design. This faux marcasite brooch measures a generous 4″ w (across) x 2″ h and looks great on any special occasion gown, dress or shawl. After your special occasion frocks are neatly tucked back in the closet, enjoy this versatile brooch to jazz up your business wear or add a splash of bling to a coat, jacket or sweater. 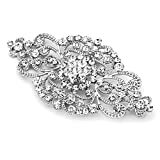 We promise you’ll adorn this stunning deco-inspired antique silver fashion pin or your money-back. Treat yourself or someone you love to some seriously gorgeous sparkle. Lifetime Guaranteed Risk-Free Purchase.